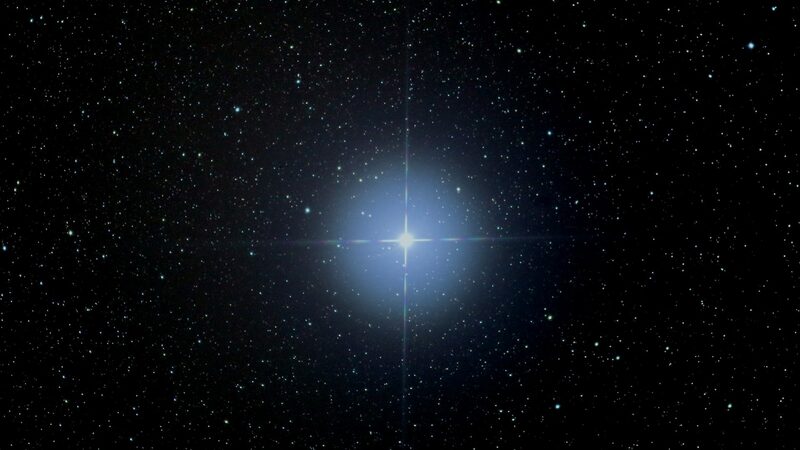 Fixed star Sirius, Alpha Canis Majoris, is a brilliant white and yellow star, the brightest star in the sky. 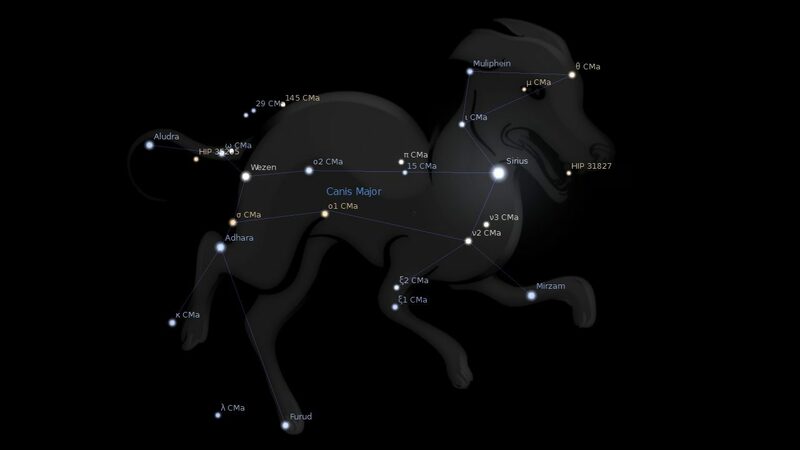 It is positioned in the neck of Canis Major, the Greater Dog. The naming of the fixed star Sirius, the Dog-star, derives from the Greek Σείριος Seirios, (Sparking, Scorching). In Egypt it was Sothis, and is depicted with Jupiter in the Dendera Zodiac, as Jupiter was conjunct Sirius during the solar eclipse of 51 BC, the day that Cleopatra’s father died. The ancient Egyptian calendar was based on lunar cycles of around 30 days and on the helical rising of the fixed star Sirius. Fixed star Sirius is of the nature of Jupiter and Mars. It gives honor, renown, wealth, ardor, faithfulness, devotion, passion and resentment, and makes its natives custodians, curators and guardians. It also gives danger of dog bites, and two examples of this effect will be found under Procyon. 1. Fixed Stars and Constellations in Astrology, Vivian E. Robson, 1923, p.34, 208, 235. 2. Fixed Stars and Their Interpretation, Elsbeth Ebertin, 1928, p.38. 3. The Living Stars, Dr. Eric Morse, 1988, p.149. 5. The Fixed Star Health and Behavior Imbalance, Ted George and Barbara Parker, 1985, p.46. 6. Manilius, Astronomica, 1st century AD, book 1, p.34-37. I have Sirius in 4. No rich family. But I like to spend a lot of time at home and work at home in a home office. AC aries. My Mc is at 14’24” Cancer….having Mercury 17 Saturn 23 and the Sun 28 in Cancer holding hands. No high Office yet lol but I always get the vibe of people looking at me with a certain look….is that why I felt and feel like a Pincess in my life? Hahaha this princess loves to clean and cook and take care of everything no matter where she turns too. Just being a bit bratty I guess but I do not need tittles nor miss them but I feel a certain way and others get that vibe of me also…..Anyone else? Hi Cheri ! Cancer and the 4th house have to do with nurturing , the mother , the home , as the place of refuge which you find comfort and emotional security.It also has to do with real estate.Chiron here would indicate a possible wounding in one of the areas I’ve just mentioned and an area that needs healing.I’m sorry to say that I can’t really define for you what this conjunction means.Maybe the things I’ve mentioned will give you some ‘ FOOD’ for thought , and you can apply it to some of the definition of sirius in this blog..